Raven went to her forever home on Thursday. 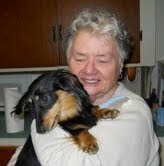 Mom Pat was so excited, she could hardly wait to get Raven home. She will have a wonderful life being Pat’s pampered baby.